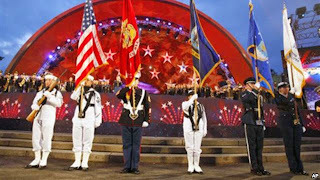 A military color guard prepares for the playing of the National Anthem at a 4th of July concert. Welcome to American Mosaic from VOA Learning English.I’m June Simms. Today is America’s Independence Day holiday. On July 4th, 1776, the 13 American colonies officially declared their independence from Britain. It took several years of fighting, but the United States won its freedom. Americans have observed Independence Day throughout the country’s history. But it did not become an official holiday until 1870. On our show today, Mary Tillotson and Steve Ember play some songs that celebrate America. 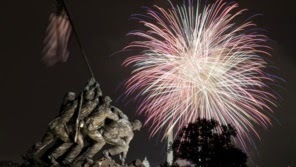 Americans celebrate the Fourth of July with family gatherings, parades, speeches and fireworks. They also celebrate with patriotic music. The official song of the United States is "The Star-Spangled Banner." Francis Scott Key wrote the words in 1814. At that time, America and Britain were at war. Francis Scott Key watched as British forces attacked Fort McHenry in Baltimore, Maryland. Through the smoke and fire, he could see a huge American flag flying over the army base. The next morning, after the battle, he looked to see which flag flew over Fort McHenry. It would tell which side had won. Key saw that the American flag still flew. He wrote a poem re-creating the event. Soon after, music was added to his words. The United States Congress made "The Star-Spangled Banner" the national song in 1931. Americans sing it at the beginning of many public meetings and sports events. Here is America’s national song, performed by Faith Hill. Some people say "The Star-Spangled Banner" is difficult to sing. Others do not like the words. 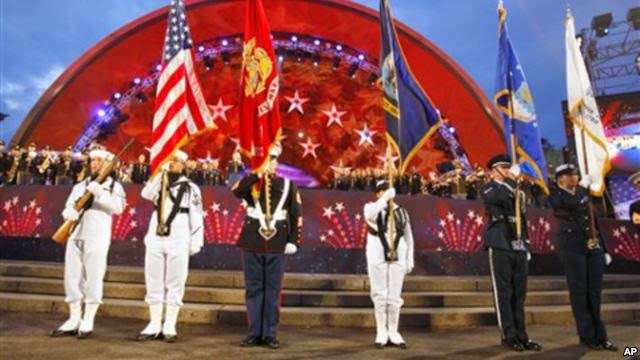 Some people have suggested that the United States change its national song. They say many other songs that celebrate America would be better. Some people think "America the Beautiful" is one of the best songs that celebrates America. Katherine Lee Bates wrote the words in 1893. Samuel Ward wrote the music. Many singers and groups have recorded "America the Beautiful." Ray Charles sings his version. Other people would like America's national song to be "This Land is Your Land." Woody Guthrie wrote the words in nineteen-forty. It became one of the most popular folk songs in America. And that’s American Mosaic for this week. Your announcers were Mary Tillotson and Steve Ember. Caty Weaver was the producer. I’m June Simms. Thanks for stopping by and be sure to return next week for another American Mosaic from VOA Learning English.